I recently spent a few weeks on vacation in Taiwan, and with some difficulty managed to find a large knife or small sword made by the Truku aboriginal tribe, formerly classified as part of the Atayal people. 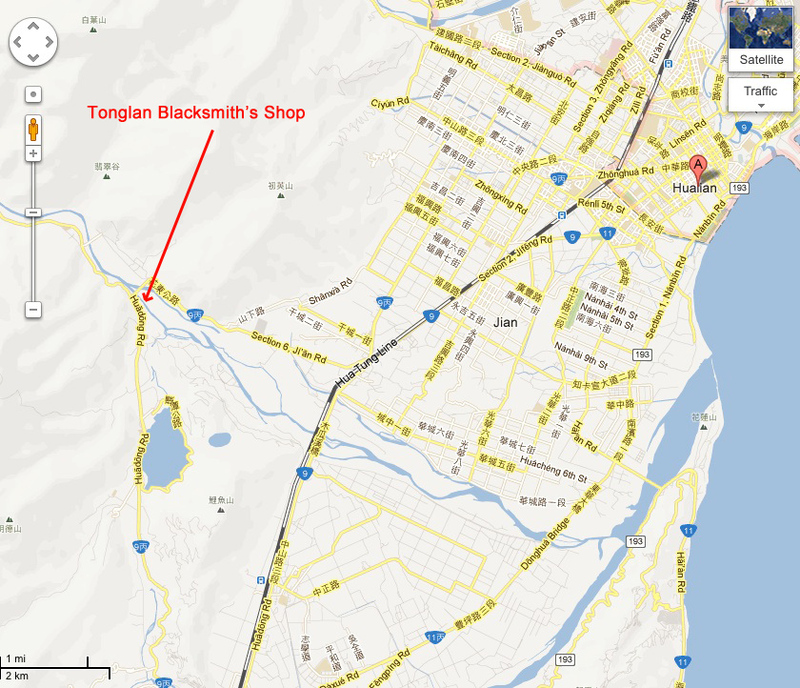 Aside from it being a unique weapon, I thought I’d post directions to the blacksmith shop for anyone who may be in Taiwan and searching for it, since it was relatively difficult to find. If you’re like I was, you primarily associate Taiwan with the Chinese, the country where Chiang Kai-shek fled to escape the communists. I was interested in visiting China without the Cultural Revolution, to see traditional Chinese culture that hadn’t been wiped out by both the Cultural Revolution and the extreme modernization where “to be rich is glorious”. And in that sense, Taiwan didn’t disappoint. The National Palace Museum in Taipei contains the largest collection of ancient Chinese artifacts in the world, for example, as when the nationalists fled mainland China, they brought many treasures with them. 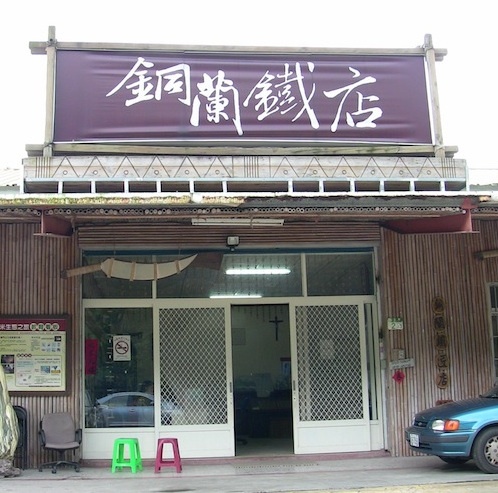 Traditional Chinese culture seemed to be alive and well in Taiwan, and talking with locals, they voiced the same idea regarding having a better preserved traditional culture than what you’ll find in much of the mainland. The movie may not be entirely accurate, but I highly recommend it if you like action movies. It was filmed in Taiwan, and the scenery is exactly what you see there, particularly in the aboriginal areas and national parks. After seeing the movie and the unique blades of the Seediq, I figured I’d have to find one for myself. 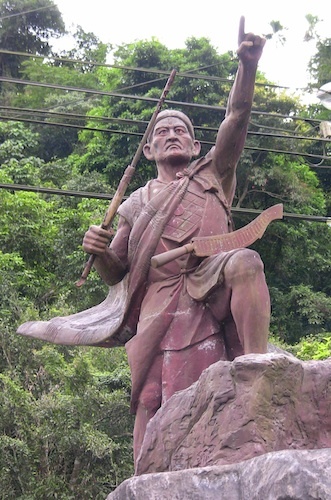 The Seediq tribe are from the Hualien area of Taiwan, and were previously grouped together with the Truku tribe as Atayal people. 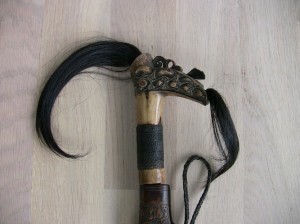 The weapons of the Atayal, Seediq, and Truku are indistinguishable, at least from what I can tell. So I searched and searched, found a few pictures of the traditional knives being sold in Taiwan, but was unable to locate them where they had been previously seen. At our hotel in the Taroko National Park, I met an Atayal man and asked him if the knives were still being made and where I could find them. He gave me directions to what may be the last aboriginal blacksmith in the country who is still making these weapons. 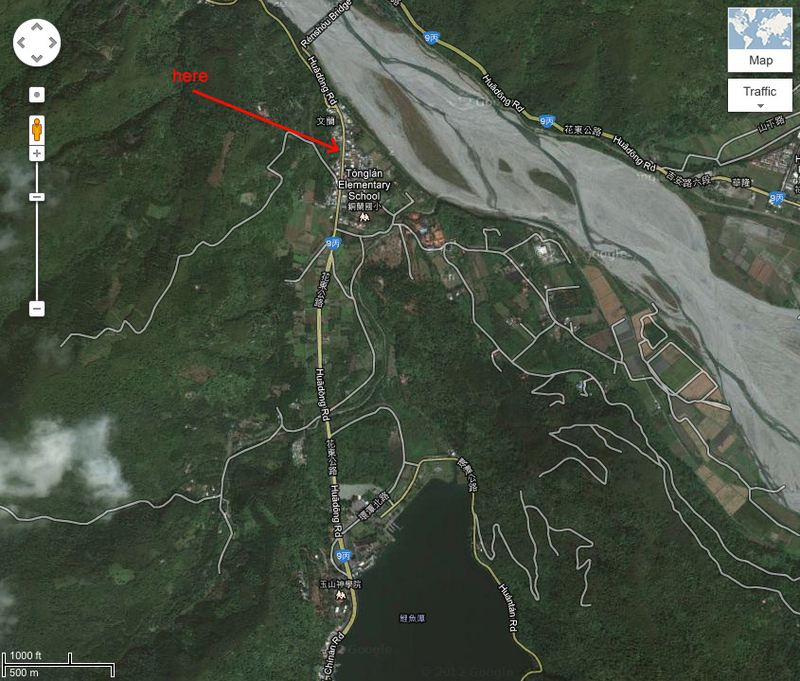 If you’re coming from Hualien and taking Highway 9, you’ll see the big lake, and should be able to find the shop from there. The problem for anyone, such as myself, who cannot read Chinese characters, is that even with a GPS you will not be able to enter in the location. Unfortunately though, it seems like the swords are no longer made. However, the knife I was able to purchase (for about $100), is fairly large at 22 inches. 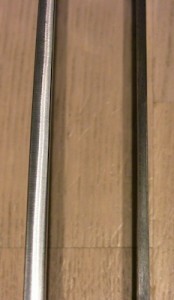 From what I’ve read, the unique open sheath design is used to keep moisture from collecting inside the sheath. 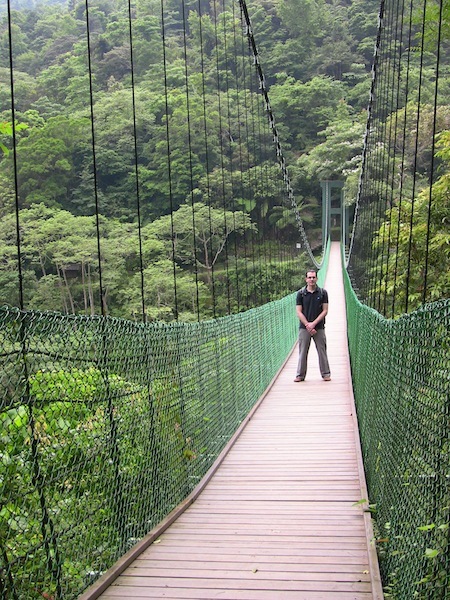 Taiwan is extremely humid, and it rains often. So this makes sense. It’s sad when quality elements and arts of traditional cultures die out, so I’m posting the information above in hopes that anyone else looking for a Taiwanese aboriginal knife or sword will be able to find the shop and keep them in business…keeping the art alive! I’ve been meaning to write a review of an incredible kukri I purchased over a year ago, and am finally getting around to it. I’ve handled many kukris, and this one is exceptional. 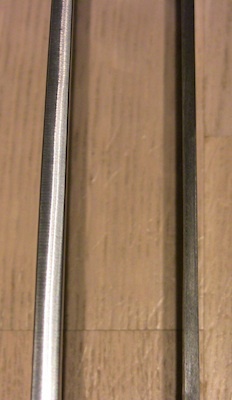 At 18.5″ long some may consider it a big knife. But this particular kurkri is massive. When you hold it in your hand, you feel like you’re holding a monster. I’d call it a short sword rather than a big knife. Really, it is a monster. I purchased it from TraditionalFilipinoWeapons.com, where I also purchased the ginunting I reviewed a couple of years ago. 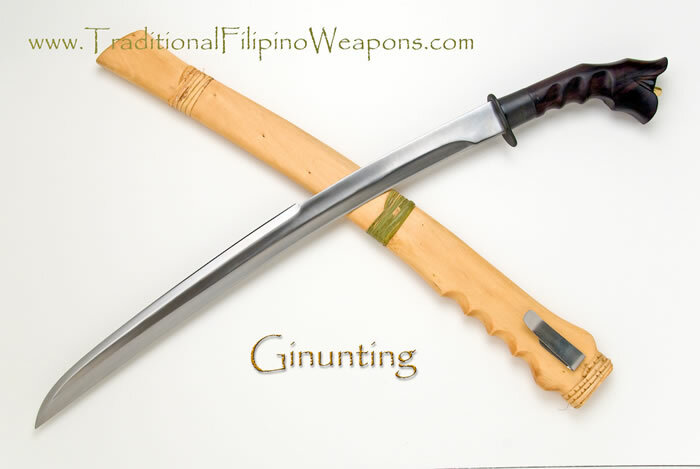 The ginunting was my favorite functional sword by a long shot, until the kukri arrived. Of course they’re very different weapons. The kukri is a Nepalese blade, made famous by the Gurkha warriors…rumored to have used them against samurai swords on occasion. While the kukri is 10″ shorter than my ginunting, it’s so massive it feels like it really could destroy a much longer sword. You can see the sheath that came with my kukri in the image above. 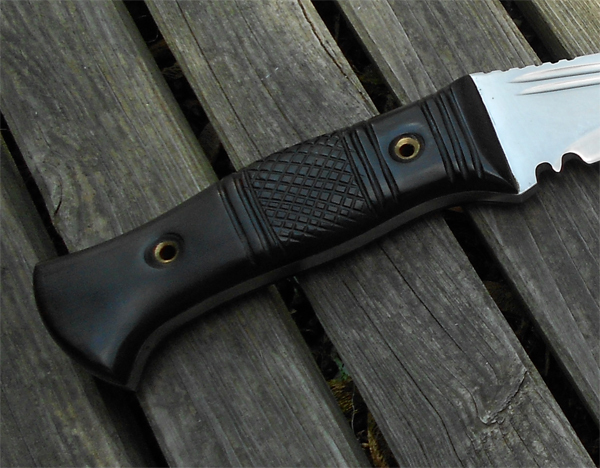 TWF shows a different sheath on their website now, but I hope they’ll still be sending out the sheath I’ve got as it’s perfect due to its narrow size and light weight. 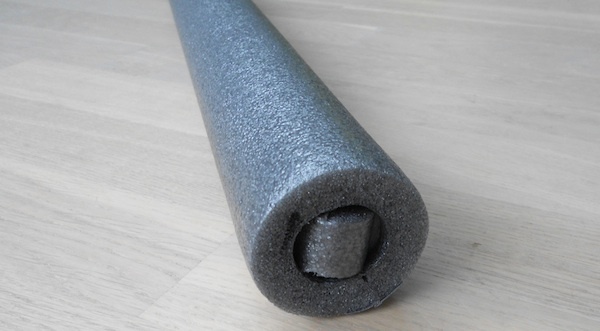 The fact that it’s much shorter than other swords I own makes it safer to practice with indoors, and the weight still makes it a great workout. It fits perfectly in a backpack, and would be an ideal companion for jungle hikes (although it could be just a little too heavy for a full day of hacking). So if you’re looking for an awesome short sword, I highly recommend it! 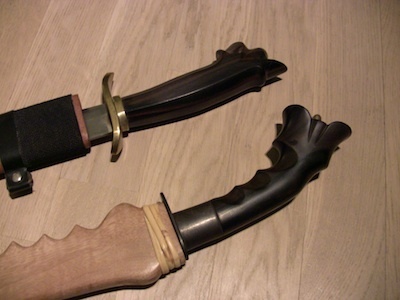 If you’d like to know how to practice with it, take a look at the first video on my stick and sword page, where I cover several great combinations of stick/sword work and footwork, several of which are with the kukri. Humans have been using weapons since the beginning of their existence, and for good reason. Weapons provide a massive advantage in both attack and defense. 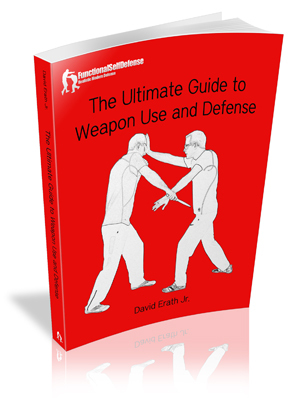 Every martial arts practitioner interested in self defense should learn how to use weapons both to better defend against their use, and to gain an advantage in a serious self defense situation. 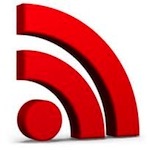 You can see how I categorize weapons and their use on my self defense weapons page. Although people in most 1st world countries no longer carry swords, practicing with them (or a stick of a similar length) can provide very valuable lessons in self defense. The methods of attack and defense that work with a sword also work with a stick, cane, hammer, wrench, knife, machete…even a household iron. You can learn to use a “stick” or any other long blunt or sharp object through the curriculum and videos on my single stick page, which I plan to add to in the very near future. Aside from the usefulness of sword and stick training for self defense, swords from different cultures can be fascinating. 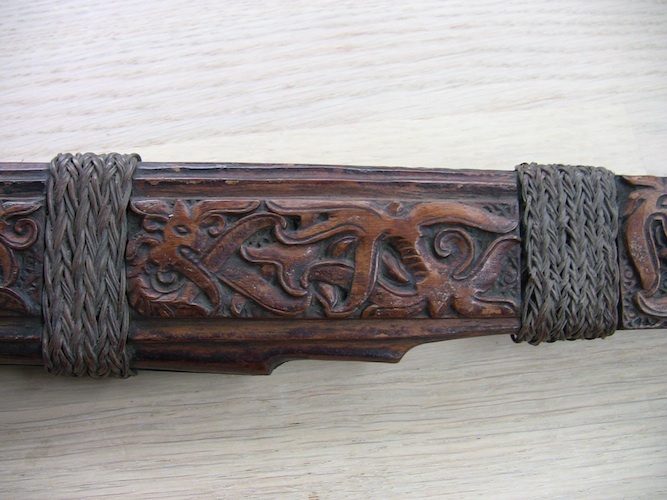 I recently posted a review of the Filipino ginunting, one of my favorite swords for functionality, and thought I’d add a few pictures of another favorite, an Iban parang from the island of Borneo. I purchased this parang in the state of Sarawak on the Malaysian side of Borneo. It’s about 100 years old, and decorated with human hair. The handle and scabbard are the most beautiful of all the swords I own. 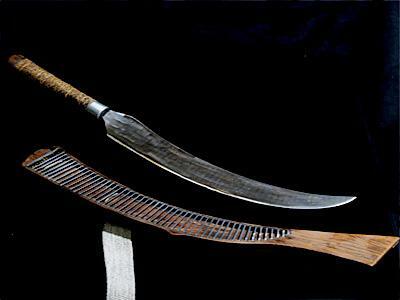 As beautiful as the parang is, it’s hard for a modern westerner to imagine they were used on head hunting raids. Up until the late 1800’s or so, several tribes of Borneo required heads for all sorts of ceremonies, from those related to the rice harvest to weddings. Imagine having to cut a person’s head off before you could be married…or walking through the jungle where people were looking for heads! In any case, the parang is an amazing sword, very similar to others used in Indonesia and the Philippines. It’s designed for one handed use, fast, well balanced, and the design of the handle prevents the parang from slipping out of your hand. I’ve asked a few older Iban about their sword training, but never really gotten any detailed answers. They do have dances that involve the use of the sword and shield, but it seems that their “martial art” was lost when the practice of head hunting was abandoned. 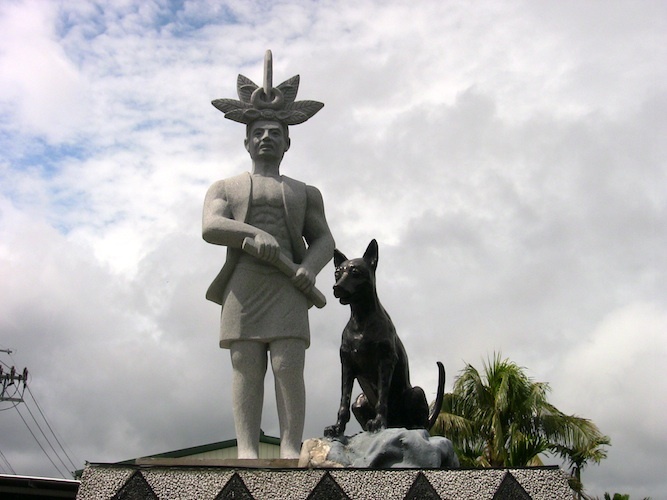 If anyone reading this has information on the martial arts of the tribes of Borneo, I’d love to hear from you! I can’t imagine people like the Iban wouldn’t have had their own martial art. If you were living in a jungle at a time when nearby tribes wanted your head, wouldn’t you? 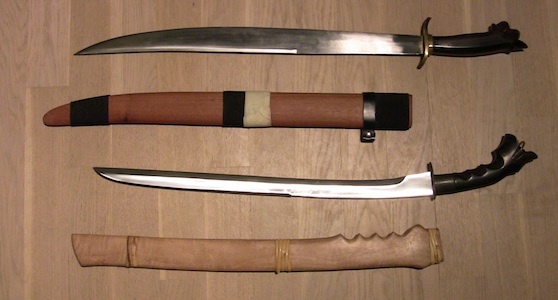 Want to learn how to use your swords with functional Filipino martial arts? Click here for video and pictures.